There is almost no point in discussing some parts of this loudspeaker. The BBC-designed LS3/5a is the stuff of legend, and in our little world as well-known, as ubiquitous, and as popular as the original Issigonis Mini. And, until recently, it was just as consigned to history as the original Mini. That’s all changed, and the Falcon Acoustics LS3/5a is a bold attempt to recreate the original design from scratch. A little history is in order, however. The LS3/5a was originally designed in the early 1970s, by the BBC Engineering Department team headed up by Dudley Harwood (the ‘Har’ in ‘Harbeth’). It was intended as a monitor for portable ‘OB’ (outside broadcast) vans and in small studios, but by 1975 was starting to be sold to home users. The sealed two-way small box used a 19mm SP1032 T27 dome tweeter with a Melinex diaphragm and a 127mm Bextrene SP1003 B110 mid-bass unit from KEF, and was, by 1970s standards at least, made to very fine tolerances (the BBC demanded the ability to match loudspeakers precisely, even if one of the pair had been bolted to a studio wall for five years, and the other was fresh off the production line). That could only be performed with a complex crossover network, resulting in a loudspeaker with a relatively low 83dB sensitivity but a benign impedance load (in this case, 15 ohms). 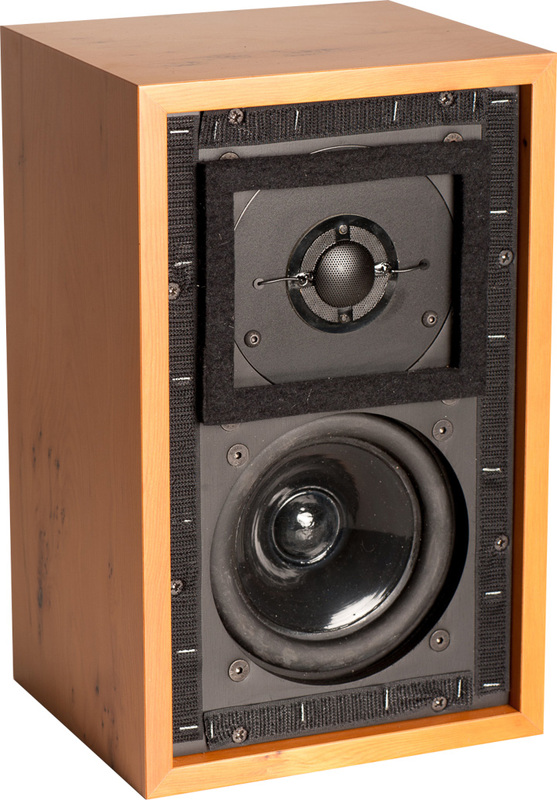 The LS3/5a continued as both a domestic loudspeaker and broadcast monitor for about a quarter of a century, but the KEF drive units were discontinued the mid-1990s, which kind of put a dampener on continued production. Also, by this time there were a number of loudspeakers inspired by or derived from the original LS3/5a, perhaps the best known being the Harbeth P3ESR. Normally, an absence of drive units would mark the end of a loudspeaker design, and in fairness there had been more than a decade of hiatus where brands went more for the spirit of the LS3/5a than the actual design; in some cases, ‘spirit’ was closer to ‘25 year old single malt’; in others it was more ‘bathtub gin that could blind a horse’. It’s here where Falcon Acoustics comes in. Falcon received a license to build the 15-ohm LS3/5a from the BBC a few years ago, and instead of making a BINO (BBC In Name Only) model with near-enough drive units, Falcon asked retired engineer Malcolm Jones to re-engineer the T27 and B110 drive units from scratch. Given that Jones’ job – before starting Falcon Acoustics – was to design and build drive units for KEF and both designs fell under his purview if any company can do this, Falcon can! The Falcon T27 and Falcon B110 are new production stock. Falcon also uses the same BBC FL6/23 crossover network circuit used in the original 15-ohm version of the original LS3/5a loudspeaker. This allows the graded drive units to be matched to the sort of tolerances the BBC first specified (and which are still hard to match to this day). The cabinet is made from Baltic ply with Beech fillets, now finished in a range of veneers, and terminating in a single pair of speaker terminals, and a pair of Tygan grille cloths. Short of getting John Arlott or Brian Johnston back for Test Match Special (not easy... they both died in the 1990s), you don’t get more classic BBC than this today. Oxford-based Falcon Acoustics is also keeping the dream alive for existing LS3/5a owners by offering everything from replacement cabinets and drivers, to full crossover networks with matched pairs of HF caps for driver matching. And yes, you could also use that Falcon B110 to repair a Linn Kan. But it’s the complete, finished LS3/5a that’s the icing on the Falcon Acoustics cake. And it’s here that I sometimes find our British sense of self-deprecation to be at its most self-destructive. The LS3/5a is one of the cornerstones of classic British audio, and yet the British are the first to point to its flaws rather than highlight its obvious benefits. Checking an LS3/5a out in mid-2018 is something of a revelation because it is still current. In fact, it’s one of those loudspeakers that benefit from a spot of modern re-evaluation and partnering; put this loudspeaker with really good, modern electronics and it shines, and some of the ‘relaxed’ criticism of the LS3/5a seems more a reflection of the amplifiers of the time than the loudspeaker itself.